For centuries the Everglades, a 70-mile-wide River of Grass, rolled smoothly southward, from the lush growth along the shores of Lake Okeechobee down to the crystal-clear waters of Florida Bay. Then in the 1920s, a crew came along with a dredge and built a massive dam. The dredge scooped muck from the marsh and piled it up to make a roadbed. The ditch that resulted became a roadside canal to help keep the highway dry. 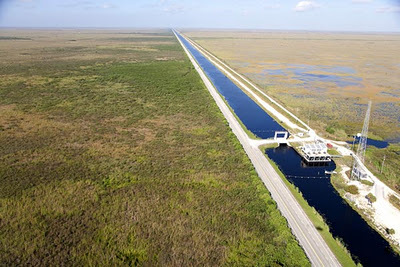 But the effect was to dam up the flow of the River of Grass along the northern boundary of what would, in 1947, become Everglades National Park. State workers have added 19 culverts under the Tamiami Trail through the years, but the flow through them today cannot match the original flow, says Dan Kimball, the superintendent at Everglades National Park. Before the road, the peak flow was 4,000 cubic feet of water per second meandering across a 10-mile-wide stretch. The culverts allow less than half that much, and it shoots through them as if being sprayed out of a garden hose. The loss of so much fresh water flow has wreaked havoc on the Everglades. Plants have died. The population of wading birds has decreased between 70 and 90 percent. On May 15, though, the dam cracked open—a little. A backhoe dug up part of the roadbed, allowing the River of Grass to flow where it had not for 85 years. That breakthrough is the culmination of a $95 million project to lift up a single mile of the highway and allow water to flow underneath. “It’s an important milestone in Everglades restoration,” says Mary Plumb, a spokeswoman for the park. Raising just that one mile of highway took 24 years of wrangling and finagling—and occasional foot-dragging—among local, state, and federal officials, army engineers, and environmental activists. But federal officials acknowledge it’s still not nearly enough. After approval of the one-mile plan, environmental groups such as the Sierra Club began lobbying for the construction of an 11-mile elevated “skyway” to replace the original highway, but federal officials dismissed the $1.6 billion proposal as far too expensive. Instead, two years ago the U.S. Department of the Interior unveiled plans for raising another 5.5 miles of the highway. The plan calls for using four different bridges, ranging in length from a third of a mile to 2.6 miles, to be built over four years at an estimated cost of $324 to $350 million. The White House has put $130 million into its proposed 2013–2014 budget to get started on raising the longest segment (2.6 miles). Environmental groups are now hopeful that some of the fines from BP’s 2010 Gulf of Mexico oil spill could be applied to the project. “The park needs this water,” says Eric Eikenberg, the CEO of the Everglades Foundation.